Prime Minister Benjamin Netanyahu’s upcoming trips to Australia, Singapore, Kazakhstan and Azerbaijan might be the most significant diplomatic visits he makes in his tenure in office. The trips will take place against the backdrop of two major international shifts that cast Israel into uncharted waters as a small state with a dizzying array of strategic threats arrayed against it. The states that he will visit are all well-positioned to help Israel navigate its next moves. The first shift is the US’s political crackup. Next week American voters will choose their next president. The major candidates, Democratic nominee Hillary Clinton and Republican nominee Donald Trump, are the weakest candidates to have ever stood for the highest office in the land. Their rise is a testament to the weakening, if not the unraveling of the glue that has held America together since the Civil War. The unraveling of the US electorate comes against the backdrop of the diminution of US military power. The US’s multi-trillion dollar investment in inconclusive if not failed wars in the Middle East over the past 15 years has come at the expense of military modernization. The F-35 program has sucked up the majority of the remaining research and development funds. And it has yet to produce a reliable airplane. Worse, the F-35’s long and problematic gestation period has given Russia and China the time and opportunity to develop air defense systems capable of neutralizing the F-35’s stealth systems. Those systems were supposed to be its chief advantage as the next generation fighter for the US and its allies. The deterioration of the US’s military capabilities has gone hand in hand with the US’s apparent loss of strategic rationality. This is apparent worldwide, but is nowhere more obvious than in the Middle East. President Barack Obama’s decision to effectively abandon the US’s major allies in the Middle East in favor of cultivating ties with Iran has made the region far more dangerous to the US and its spurned allies than it was eight years ago. True, in theory, Obama’s decision to prefer the Shi’ites to the Sunnis makes sense given the totalitarian and imperial nature of Sunni jihadism. But in light of the genocidal, totalitarian and imperial nature of the current Iranian regime, his move made no sense and its impact has been massively destructive. Moreover, Obama’s willingness to rack up the US’s national debt in an unprecedented manner and repress economic growth through overregulation has left a large question mark over the possibility of a military buildup. In other words, even under the best circumstances, it is hard to imagine that the US will be capable of reestablishing its global primacy over the next four years or even over the next decade. The implications for Israel are far reaching. For decades, Israel’s strategic posture has been predicated on its ability to depend on US power. This strategic posture is no longer tenable. The second major international shift is Russia’s sudden rise as the primary global power in the Middle East. As Channel 2 reported Sunday night, Russia has deployed sophisticated naval and air systems in the region that can detect all of Israel’s air and naval operations. In a matter of months, Israel has lost the air and naval supremacy it has enjoyed for the past four decades. The air force reportedly is convinced that the F-35’s stealth systems will be able to neutralize Russia’s detection capabilities. But given the well-documented current problems with the F-35’s stealth systems, this conviction is unwise. And even under the best circumstances, in which Israel has the opportunity to develop its own electronic warfare systems and apply them to its F-35 without American interference, it will take Israel years to surmount the challenge that rapidly improving Russian systems present to our air force. According to Channel 2’s report, air force and naval commanders are in a panic over the sudden turn of events. Rather than panicking though, Israel needs to roll with the punches and figure out how best to cope with this new situation. The obvious answer is that we need to quickly expand our capabilities in areas that Russia’s military primacy does not reach. Specifically, Israel needs to expand massively its capacity for under-the-radar operations. The first area that needs to be massively strengthened is our intelligence capabilities, particularly human intelligence capabilities. Israel should be investing massively in developing and expanding our cultivation and direction of proxies on the ground throughout the region. Second, Israel needs to adapt its cyber technology capabilities in a manner that diminishes our enemies’ ability to strike us. 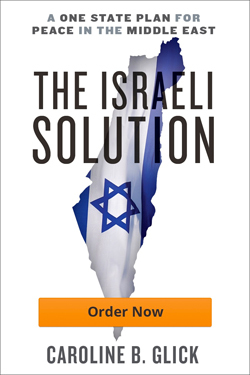 Israel needs to be able to disrupt and disable command and control and other systems. Israel’s reach needs to extend as low down the line of its enemies’ military chain of command as possible. If our offensive capabilities are being checked, so must the capabilities of our enemies. Indeed, our enemies need to be subverted. Part of the intelligence and cyber capabilities that Israel must develop and deploy must be geared toward destabilizing with the goal of overthrowing the regime in Iran. At the same time, Israel should be empowering anti-regime sectors in Iran in a manner that expands the prospect of developing close ties with a successor regime along the lines of the strategic alliance Israel built with the regime of the shah in the decades which preceded the 1979 Islamic revolution. Third, Israel needs to expand and diversify the capabilities of our ground forces. Israel needs to be capable of using new means to deploy its fighters at home and on distant shores. It needs to align its both its special and regular forces with the new threat environment. And it needs to be able to utilize its ground forces in manners that can extend the reach and diminish the compromised positions of its air and naval assets in the era of Russian regional primacy. Fourth, Israel needs to expand its economic growth and diversify its economic ties in a manner that positions it as a regional economic power. It needs to use it natural gas resources specifically as a means to expand and deepen its ties with Asia. Such economic growth and power will positively influence Russia’s willingness to allow Israel to carry out air and naval operations against its enemies – and Russia’s allies in Lebanon, Syria and beyond. In other words, the more economically powerful Israel is, the more Russia will be willing to side with Israel against Hezbollah and others that are currently operating under the Russian umbrella. This then brings us to Netanyahu’s upcoming trips. Each state that he will visit has something to offer Israel in expanding its intelligence, cyberwarfare and economic capabilities. Australia, a major Western economy, is moving toward China as America has become less engaged in the Pacific. Israel has an acute interest in using Australia as a platform for expanding its ties to China and other Asian countries, both because of the economic advantages such ties convey and due to China’s strategic importance to Russia. As for Singapore, Israel effectively built the Singaporean military in the 1960s and 1970s. The country remains extremely supportive of Israel. Like Australia, Singapore has close ties to China. It has technological and other capabilities that can be extremely advantageous for Israel today. Azerbaijan and Kazakhstan are critically important to Israel today. Their strategic proximity to Iran, and their ties to Russia, along with their ethnic composition and their natural resources make securing good relations with both critical to Israel’s ability to advance and security its strategic interests in every sphere. Israel has tremendous assets to offer each of the four countries that Netanyahu will visit. These assets must be deployed wisely to ensure that Israel gains as much as possible from his trip and from its future ties with all of them. Given the dramatic changes in the global power balance, and their implications for Israel, Netanyahu’s decision to fly to visit these four countries just after the US elections tells us that he gets it. At a time of regional and global turbulence and uncertainty, in the context of swiftly multiplying threats, this is no small matter.